With the May release of Sorpresa Familia, (“Surprise Family”), Catalonian juggernaut MOURN leaps the third album hurdle with equal amounts of snarl and grace. Thematically, the record is consumed by the narrative of the battle with their former label that saw them unable to tour or record for a period of time, and left their second album, 2016’s Ha Ha He, unreleased in their home country. For historical precedent, see Bruce Springsteen’s Darkness On The Edge Of Town, created under the shadow of a similar battle with a manager that threatened his career. Like the aforementioned, MOURN have cemented their relationship with current label Captured Tracks and turned lemons into lemonade in a big way on Sorpresa Familia with what at first glance is a driving uptempo track, (“Fun At The Geysers”), quickly shows its teeth. “Doing It Right,” “Divorce,” and “Bye Imbecile!” highlight the struggle, while musically, the band has only gotten tighter with the entire LP clocking in at just over half an hour and not a note wasted. The interplay between guitarists Carla Pérez Vas and Jazz Rodriguez Bueno is more intricate, and the stellar rhythm section of Leia Rodriguez and Antonio Postius remains the group’s secret weapon. Outsider anthem “Strange Ones” will certainly figure in a Nest End Of The Year list, with the rocking “Candle Man” and emotional and haunting “Orange” boding well for the band’s future musical progression. “Epilogue” and “Sun” take a measure of the journey, and add a hopeful twist to the end. 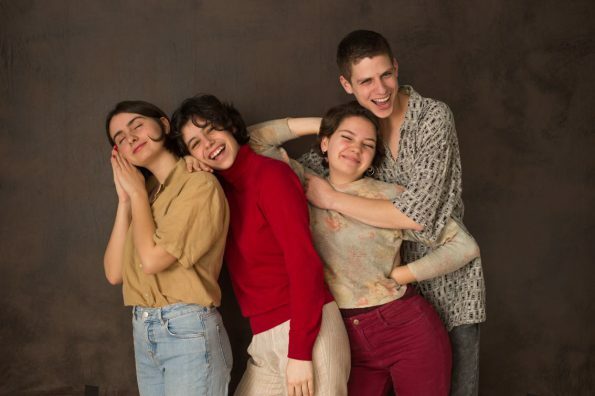 Sorpresa Familia marks the moment where MOURN can step back and shake off the ever-present “young” adjective attached to every description of them and settle into being simply, a great band. For those new to the band, a great place to begin is last year’s covers EP, Over The Wall, featuring their takes on Hüsker Dü, Echo and the Bunnymen, and the Replacements.